An arts-focused kids-night-out in downtown Northampton! 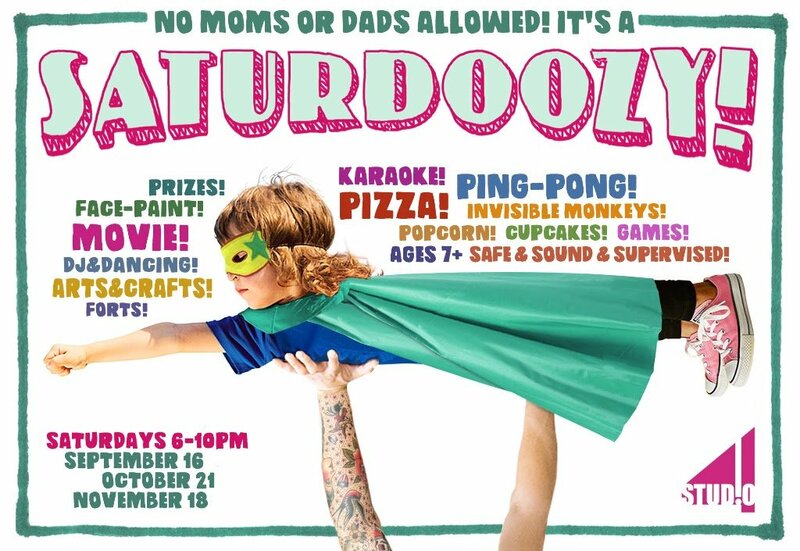 STUDIO4, the vibrant community performance space and arts center located in the heart of Northampton, is launching a packed season of dance, music, film, and theater programs for all ages, and is proud to announce a new monthly event for kids only: SATURDOOZY!—an arts-focused kids’ night out. Fun, safe, and supervised, SATURDOOZY! welcomes children ages 7 and up, and will feature a DJ and dancing, plenty of games, ping-pong, arts and crafts, karaoke, face-painting, and a movie, plus pizza and a bevy of fun snacks! Parents can opt for “valet service”—curbside pickup of their children at the end of the night. SATURDOOZY! will take place on the third Saturday of each month, beginning on September 16th, from 6-10 PM. Admission is $30 (for 10pm pickup) or $20 (8pm pickup). Additional siblings admitted at half price. Preregistration is recommended, at studio4noho.com or by phone: (413)570-4491. STUDIO4 is a hub for the arts in Northampton, maintaining the last, large downtown performance space for our community and programming a diverse array of performing arts. STUDIO4 is home to The School for Contemporary Dance and Thought (SCDT), which presents local and internationally renowned artists as part of a broad slate of dance performances, lectures, classes, and panels.